MTSU’s Quest for Student Success, its decision to accelerate its move into Conference USA and a gift by Nobel laureate and alumnus James Buchanan were among the year’s top stories as reported by MTSUNews.com. McPhee, speaking at the Fall Faculty Meeting that launches each new academic year at MTSU, said Gov. Bill Haslam has made retention and graduation the top priority of the state’s higher education system. In October, MTSU unveiled a sweeping set of reforms that its president and provost say will target processes and practices that create barriers to student success. The Quest for Student Success plan, advanced by Provost Brad Bartel and endorsed by McPhee, calls for the university to identify and rework general core courses with high academic failure rates. It outlines plans to revamp academic advising and develop customized graduation maps for each student. Middle Tennessee State University said it would become a full member of Conference USA on July 1, deciding to separate early from the Sun Belt Conference. MTSU announced Nov. 29, 2012, that it would join C-USA no later than July 1, 2014. However, the university decided to negotiate with C-USA and the Sun Belt to make the move at the start of the academic year. With area lawmakers and other friends on hand, Turner Construction Co. celebrated a milestone for the $147 million MTSU Science Building with a special “topping out” ceremony. Turner team members set a signed steel beam, with MTSU and Turner logos on opposite ends, atop the 250,000-plus gross square foot facility, which is scheduled to open in early 2015. MTSU alumnus Josh Kear brought home his third Country Song of the Year honor at the 55th annual Grammy Awards Feb. 10, winning recognition for Carrie Underwood’s “Blown Away” to join his earlier wins for Lady Antebellum’s “Need You Now” and Underwood’s “Before He Cheats.” Kear, a 1996 history graduate of MTSU, co-wrote Underwood’s newest winning song, which also served as the title of her latest album, with Chris Tompkins. Judith Iriarte-Gross’ nearly 18 years as a passionate advocate for four areas of science as career possibilities for girls and young women led to special recognition from MTSU President Sidney A. McPhee. McPhee presented Iriarte-Gross with the President’s Silver Column Award; she was the fifth recipient of the honor since the president established the award in 2004. State Rep. Beth Harwell of Nashville, speaker of the Tennessee House of Representatives, was honored as the second “Distinguished Friend of the University Honors College.” Harwell, the first female House speaker in Tennessee history as well as in the Southeast, was the featured morning-ceremony speaker for MTSU’s fall 2012 commencement. David J. Urban was selected to be the next dean of the Jennings A. Jones College of Business at Middle Tennessee State University, the school announced March 21. Urban was executive associate dean and a marketing professor at the School of Business at Virginia Commonwealth University in Richmond, Va. Hundreds of MTSU students participated in ‘The Big Event’ community service project in the spring. For the first time since 1985, both the MTSU men’s and women’s basketball teams were invited to the NCAA tournament during the same year. It was the first time in 24 years the men’s basketball team made an appearance in the big dance, earning a No. 11 seed and capturing the Sun Belt regular-season championship. MT women’s basketball team earned their fifth consecutive NCAA Tournament appearance, receiving a No. 12 seed after winning the Sun Belt tournament championship. The United Way of Rutherford and Cannon Counties teamed with MTSU for a massive volunteer effort. MTSU’s “The BIG Event,” held on March 23, was the largest one-day student-run service project in the nation. Dr. Cliff Ricketts’ five decades of research and exemplary classroom teaching were recognized when MTSU President Sidney A. McPhee surprised the 37-year MTSU School of Agribusiness and Agriscience faculty member with the President’s Silver Column Award. He was the sixth recipient of the award. In March, Ricketts and his team travelled coast-to-coast on “sun and water” alternative-fuel vehicles, garnering national media attention. Ken Paulson, a lawyer who combined his passions for journalism, free expression and popular music to become a national advocate for the First Amendment, was hired next dean of the College of Mass Communication at Middle Tennessee State University. Paulson, president and chief executive officer of the First Amendment Center in Nashville and Washington, D.C., assumed leadership of the college on July 1. MTSU announced it purchased the former Middle Tennessee Medical Center site near downtown Murfreesboro. The university paid $11.1 million for the 17.4-acre site, which includes the 115,000-square-foot Bell Street Building; a 143,000-square-foot parking garage with 407 parking spaces; surface parking with 188 spaces; and a large green-space area that was the site of the old main hospital building. Middle Tennessee continued its dominance of the Sun Belt Conference by winning the 2012-13 All-Sports Trophy for a league record-tying fifth straight time. The Blue Raiders equaled the consecutive mark of five in a row set by South Florida from 1978 to 1982. The Blue Raiders left the SBC like they came in, by winning the Vic Bubas All-Sports Trophy. Overall, MT won the award given to the top all-around sports program for the ninth time in 13 years. Middle Tennessee’s championship was bolstered by regular season titles in men’s and women’s basketball, and women’s soccer while garnering conference post-season championships in women’s basketball and men’s outdoor track. Middle Tennessee State University signed a pact to become the first American university to establish formal ties with an institute in China’s leading design center for household appliances and technology. The agreement with the Research Institute of Industrial Design was secured during a two-day visit by a MTSU delegation to the Shunde District in China’s Guangdong Province. More than 2,640 MTSU degree candidates heard Gov. Bill Haslam and MTSU alumnus Pete Fisher, vice president and general manager of the iconic Grand Ole Opry, deliver remarks at MTSU’s two May commencement ceremonies. Also, the university awarded its first honorary doctorates to two of its most esteemed alumni: former U.S. Congressman Bart Gordon and the late Nobel laureate James M. Buchanan. Middle Tennessee State University was again recognized for its community service efforts with inclusion on the 2013 President’s Higher Education Community Service Honor Roll. The Higher Education Community Service Honor Roll, launched in 2006, annually highlights the role colleges and universities throughout the nation play in solving community problems and placing more students on a lifelong path of civic engagement by recognizing institutions that achieve meaningful, measureable outcomes in the communities they serve. A $2.5 million bequest from the estate of economist James M. Buchanan to the MTSU Honors College was announced in special ceremonies outside the Paul W. Martin Sr. Honors Building. Buchanan’s nephew Jeff Whorley of Indianapolis made the announcement to MTSU President Sidney A. McPhee, Honors College Dean John Vile, guests, the campus community and alumni and friends of the university. The Buchanan family also presented the university with the late alumnus’ Nobel Memorial Prize to be displayed on campus as a loaned exhibit. Some students attending Nashville State Community College’s satellite campus in southeast Davidson County can now turn their associate degree into a bachelor’s degree from Middle Tennessee State University — without the commute. MTSU and Nashville State announced a transfer agreement that will allow NSCC students with associate degrees in criminal justice-related majors to earn an MTSU bachelor’s degree in criminal justice administration or liberal studies. The number of MTSU students studying abroad during the summer and the 2013-14 academic year hit an all-time high. In all, 193 MTSU students received a total of $279,000 in institutional scholarships to support their studies abroad. Sixty percent of MTSU study-abroad students participate in signature programs led by MTSU faculty. Five MTSU students are recipients of stipends totaling $19,000 from one of the most prestigious scholarship programs in the nation. Middle Tennessee State University’s research partnership in China on modern uses of ancient herbal remedies has yielded almost 40 results showing promise in treating cancer, viral infections and other ailments. The report came as an MTSU delegation concluded its visit to the Guangxi Botanical Garden of Medicinal Plants. Located in Nanning in southern China, the garden, named as the world’s largest medicinal herb garden, features more than 7,400 medicinal plants. Nashville Mayor Karl Dean presented MTSU with an Honorable Mention for the Mayor’s Award for Outstanding System-Wide Partner as part of the 31st annual PENCIL Foundation’s BRAVO! Awards. Of the 820 PENCIL Partner volunteer groups, the Mayor’s Award for System-Wide Partners was given to only two organizations — MTSU and the Charles Davis Foundation. The honor encompasses the hundreds of volunteer hours donated by MTSU students, faculty and staff during the 2012-13 academic year. More than 260 rising high school juniors and seniors from across Tennessee arrived for the four-week 2013 Tennessee Governor’s School for the Arts at Middle Tennessee State University. The event, which provided high quality arts education for gifted and talented Tennessee high school students, included individual and group instruction designed to help each student explore talents in music, ballet, theatre, filmmaking and visual art. MTSU celebrated its July 1 entry into Conference USA with a multimedia celebration and pep rally. The university unveiled a special logo marking its inaugural season in the league. MTSU President Sidney A. McPhee announced a strategic reorganization of the university’s development and communications operations under a plan approved by the Tennessee Board of Regents. Joe Bales became vice president for university advancement and Andrew Oppmann was named vice president for marketing and communications. McPhee said the moves put a greater emphasis on corporate outreach; strategic branding and positioning; and accelerating the university’s successful $80 million Centennial Campaign. A Chinese education group signed cooperation pacts with Murfreesboro City Schools and Rutherford County Schools for cultural and educational exchanges. The agreements, facilitated by MTSU’s Confucius Institute, promotes future educational and cultural activities, such as summer camps and symposiums, involving middle school students and educators from the local districts and Dongcheng Education Group of Hangzhou Normal University in China. Tennessee Gov. Bill Haslam announced MTSU’s Dr. Carroll Van West has been appointed state historian. West replaces the late Walter T. Durham, who served 11 years in the honorary position. West has served as director at the Center for Historic Preservation at MTSU and the Tennessee Civil War National Heritage Area since 2002. He has taught as a professor in the MTSU history department since 1985. As they stepped off the bus outside MTSU’s Kennon Hall of Fame, many members among the delegation of 30-plus visitors from Hangzhou, China, had their smart phones in hand to capture a slice of American culture. They were met by plenty of smiles, handshakes and music as band members and cheerleaders from Siegel High, the Discovery School at Reeves Rogers, Central Magnet School and MTSU performed along a balloon-lined entrance to the Hall of Fame. A record 72 alumni and friends of Middle Tennessee State University learned “Whodunit?” by attending the sixth annual Alumni Summer College. The event was held in early summer inside MTSU’s Student Union and off-campus at the Tennessee Miller Coliseum, the Tennessee Bureau of Investigation headquarters in Nashville, the Tennessee Fire Service and Codes Enforcement Academy near Deason, Tenn., and the Bell Buckle Banquet Hall. With a beaming smile and a winning way with words, it’s easy to see how James Lee was elected president of MTSU’s Student Government Association for 2013-14. The Clarksville native, whose early years were spent on the road because of his father’s service in the U.S. Army, chose MTSU to take advantage of the freedom a college campus offers while staying close enough to home to keep in touch. MTSU President Sidney A. McPhee, delivering his State of the University address, outlined challenges ahead in the 2013-14 academic year and said “nothing is more important than … ensuring our students’ academic success.” McPhee, speaking at the Fall Faculty Meeting that launches each new academic year at MTSU, said Gov. Bill Haslam has made retention and graduation the top priority of the state’s higher education system. The MTSU Foundation celebrated 17 faculty members for their outstanding work and service to the university and community with special awards at the Fall Faculty Meeting. Highlighting the recognition was the Career Achievement Award, presented to Dr. William F. “Bill” Ford, professor of economics and finance and holder of the Weatherford Chair of Excellence in Finance in the Jones College of Business. The 12th honoree to receive the award, the 77-year-old Ford thanked the selection committee for an honor he said he never thought he’d receive. Football player Steven Rhodes made national headlines after the NCAA ruled he was ineligible to play this season because of his participation in a Marine Corps recreational league. The NCAA changed course two days later, thanked him for his service and allowed him to play. Middle Tennessee State University announced in August that it recorded its second-largest fundraising total in its history during the 2012-13 fiscal year, bringing in almost $14 million in gifts from more than 9,000 donors. The totals from the university’s last fiscal year, which ended June 30, has helped MTSU pass the 85 percent mark toward its $80 million Centennial Campaign. That effort stood in August at more than $70 million, with 17,721 donors. MTSU had its highest annual total of alumni gifts in 2012-13, recording 5,287 separate donations. Dr. Michael Arndt, outgoing president of MTSU’s Faculty Senate, was the summer commencement speaker. The university conferred 870 degrees during the ceremony. With the swipe of his university ID, MTSU Student Government Association President James Lee watched the mechanical arm-gate smoothly rise, allowing him to drive his black sports coupe ahead to officially open one of two new student parking garages on campus. Students paid for the $23.5 million garages through fees instituted a few years ago. Built by Messer Construction, the two four-deck structures will add almost 1,000 net parking spaces to a growing campus that has been challenged for years with providing adequate parking near the campus core. Middle Tennessee State University welcomed the largest class of new freshmen and the largest population of new transfer students among the six universities in the Tennessee Board of Regents system. MTSU’s new freshman population increased by almost 2 percent over last year, growing to 3,179 as of the 14th day of classes, the date TBR uses as the system’s enrollment snapshot. MTSU President Sidney A. McPhee and Vice Minister Xu Lin of China, director-general of the worldwide Confucius Institute network, shared their cultures, ideas and a few gifts during a visit by Xu to the State Capitol and the campus. Dr. Lana Seivers, right, dean of the MTSU College of Education, makes a point while discussing education programs at the Sept. 17 True Blue Tour stop in Chattanooga. Listening are, from left Cathy Duckworth, Abby Duckworth, Carroll Duckworth and Freya Chilton. Abby Duckworth and Chilton are seniors at East Hamilton High School. A local pastor is spearheading a grassroots effort to deepen support for Middle Tennessee State University academics and athletics across all segments of the community. The Rev. James McCarroll, pastor of First Baptist Church on Castle Street in Murfreesboro, announced the “True Blue Community Initiative” inside his church’s fellowship hall as about 70 Blue Raider supporters donning blue attire looked on. Among the attendees were alumni, donors, community leaders and members of the university’s athletic department and administration. MTSU Arts production of the Oscar- and Tony-winning musical “Les Misérables” drew four consecutive sellouts of Tucker Theatre, setting a record for the facility. The music and theater programs in the College of Liberal Arts produced the show. The Tennessee Higher Education Commission granted MTSU’s request to create a mechatronics engineering program. Offered with the support of local industries, including Nissan and Bridgestone, the bachelor’s degree program makes MTSU a full-fledged engineering school. Middle Tennessee State University’s top administrators and deans met with record numbers of prospective students in six Tennessee cities in September and October as part of the university’s annual True Blue Tour. The statewide tour, organized by the university’s Admissions Office, include student receptions in Chattanooga; Johnson City; Knoxville; Nashville; Memphis; and Jackson. Inspector Javert (MTSU junior Bill Hennings), left, argues with Jean Valjean (MTSU junior Drew Jenkins) over the body of Fantine (alumnus Alice M. Clements) during rehearsals for the MTSU Arts production of “Les Misérables” in Tucker Theatre. Performances are set Sept. 19-22. Music icon Barry Gibb easily traced the genealogy of the Bee Gees classic “How Can You Mend a Broken Heart?” for more than 900 fans and friends at MTSU’s Tucker Theatre. The audience, which almost filled the 1,000-seat venue, rose and applauded Gibb for one of several standing ovations offered throughout the evening. Gibb was also named the Inaugural Fellow of the Center for Popular Music. Ground was broken on an indoor tennis facility at Old Fort Park that will greatly enhance Middle Tennessee State University’s tennis program while providing greater opportunities for the burgeoning local tennis community. Located on Old Fort Parkway, the $3.7 million facility will feature eight indoor courts, electronic scoreboard, a pro shop, locker rooms, lounge area and meeting area. The facility will be open to the general public and serve as the home of the Blue Raider men’s and women’s tennis programs. State Rep. Jeremy Faison, with a team of researchers and administrators from MTSU in tow, set out in the woods of Cocke County to dig for ginseng. MTSU President Sidney A. McPhee and state Sen. Bill Ketron, R-Murfreesboro, went on the hunt as well. MTSU’s partnership with the Guangxi Botanical Garden of Medicinal Plants in China is exploring the uses of ancient herbal remedies in modern medicine. MTSU unveiled a sweeping set of reforms that its president and provost say will target processes and practices that create barriers to student success. The plan, advanced by Provost Brad Bartel and endorsed by President Sidney A. McPhee, calls for the university to identify and rework general core courses with high academic failure rates. It outlines plans to revamp academic advising and develop customized graduation maps for each student. The Tennessee Supreme Court met on the MTSU campus to hear three appeals as part of its Supreme Court Advancing Legal Education for Students program, or SCALES. The session, the first held on campus for MTSU students, was sponsored by the university’s American Democracy Project. MTSU’s Ginseng Initiative to grow and harvest the plant at the university’s Experiential Learning and Research Center in Lascassas, Tenn., will boost state revenue and potentially take years off the growing process. Joined by state Sen. Bill Ketron, who suggested the university grow ginseng at its 438-acre farm, MTSU President Sidney A. McPhee announced a research partnership between a group led by Tennessee Center for Botanical Medicine Research Director Elliot Altman, Farm Laboratories Director Matthew Wade and School of Agribusiness and Agriscience Director Warren Gill. The family of country music icon George Jones is joined by MTSU President Sidney A. McPhee on Monday at the Woodlawn Roesch-Patton Funeral Home and Memorial Park in Nashville to announce the creation of a fund to establish a scholarship at MTSU in Jones’ memory. Leaders of Middle Tennessee State University and Guangxi University in Nanning, China, strengthened ties with an agreement to pursue cultural and academic exchanges between the two institutions. 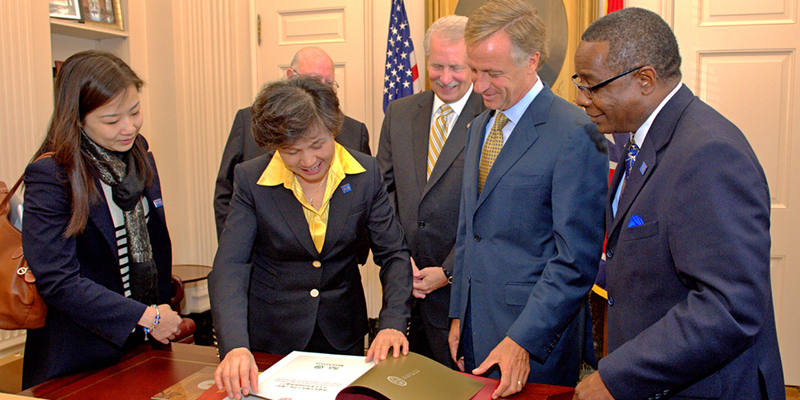 MTSU President Sidney A. McPhee and Guangxi University President Zhao Yanlin signed the memorandum of understanding following a roundtable discussion between executives from both universities. The widow of country music icon George Jones announced that her family has established a scholarship fund at Middle Tennessee State University that they hope will become a living memorial to the late singer. Nancy Jones announced the creation of the fund at a Nashville ceremony to unveil a monument to her husband of 30 years. The way MTSU President Sidney A. McPhee sees it, Ron Malone deals with “one of the most challenging activities on this campus: parking.” Malone was recognized for meeting that challenge for the last 13 years as assistant vice president for events and transportation, as well as the other challenges he’s resolved in his 25 years of work at MTSU. He was the seventh recipient of the President’s Silver Column Award. Four days of activities on the MTSU campus in November honored veterans and active-duty military personnel. The university’s 32nd annual “Salute to Armed Services” activities coincided with the MTSU Blue Raiders’ Conference USA football game against Florida International University. Two prominent MTSU alums, Smyrna Mayor Mary Esther Reed and state Sen. Bill Ketron, addressed graduates at MTSU fall commencement services. The university conferred 1,977 degrees during the two ceremonies. The presidents of MTSU and Alabama A&M University signed a memorandum of understanding Dec. 13 that encourages greater collaboration on faculty and student scientific research in the areas of aerospace, agriscience and engineering. MTSU President Sidney A. McPhee signed the agreement with AAMU President Andrew Hugine Jr. following McPhee’s visit to campus as keynote speaker for the commencement ceremony at the historically black university. University employees showed their True Blue spirit in a big way for the 2013 Employee Charitable Giving Campaign. The campaign, which was part of an overall Tennessee Board of Regents’ theme of “Timeless Value in Giving,” smashed its goal of $115,000 with a record grand total of $128,099.50 — or 111.4 percent of the goal. MTSU junior Sean Martin was appointed by Tennessee Gov. Bill Haslam to the state’s new Veterans Education Task Force. Martin, the only student on the task force, served in the U.S. Marine Corps from 2005 to 2009 and was a police transition team adviser for Iraqi police departments in the al-Anbar region from March through October 2008. MTSU President Sidney A. McPhee was awarded Person of the Year honors by the global organization of Confucius Institutes in recognition of the university’s work to strengthen educational and cultural ties between China and the U.S. China’s highest-ranking education leader, Vice Premier Liu Yandong, presented the award to McPhee during the eighth annual Global Confucius Institute Conference in Beijing, which attracted more than 2,200 attendees from 110 countries. Also, at the invitation of Xu Lin, vice minister and director-general of the Confucius Institutes, McPhee also delivered remarks during the opening session of the conference. The Blue Raiders football team earned its fourth bowl invitation in the Rick Stockstill era and first as new members of Conference USA. Middle Tennessee officially received an invitation to represent Conference USA in the 11th Bell Helicopter Armed Forces Bowl on Monday, Dec. 30. It will mark the fourth bowl game of the FBS (I-A) era for Middle Tennessee and the eighth bowl game in school history.